The Glory satellite's Taurus XL rocket stands on Space Launch Complex 576-E at Vandenberg Air Force Base in California. NASA's newest satellite to study Earth's climate is poised to blast off in the wee hours of Friday (March 4) after a week of delays due to technical problems. The climate-monitoring Glory satellite is now set to launch from California's Vandenberg Air Force Base on Friday at 2:09:43 a.m. PST (1009:43 GMT). 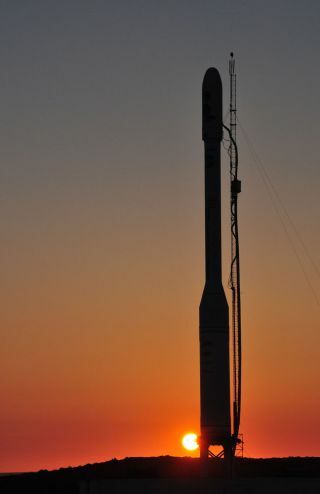 A Taurus XL rocket built by the rocket manufacturer Orbital Sciences will launch the satellite. NASA initially planned to launch the Glory mission on Feb. 23, but called off the attempt just 15 minutes before liftoff due to a technical malfunction with the satellite's Taurus XL rocket. A malfunctioning computer was sending launch controllers incorrect information on the rocket's status, NASA officials said at the time. "Those issues have been resolved," NASA officials said in a statement this week. The $424 million Glory mission is aimed at studying how radiation from the sun, along with small particles called aerosols, affect Earth's atmosphere and climate. Aerosols can be natural – created by desert dust and volcanoes – or can have manmade origins such as air pollution. The satellite weighs about 1,157 pounds (525 kilograms). It is just over 6 feet (nearly 2 meters) tall and 4.6 feet (1.4 meters) wide, making it about the height of a tall adult human and as wide as an oil barrel. Glory is not the only satellite riding into space aboard the Taurus XL rocket. The booster is also carrying three small nanosatellites, called Cubesats, which were designed and created by university and college students, NASA officials said. The tiny satellites are launching as part of NASA's Educational Launch of Nanosatellites program.